The Birkhead Insulated Waterproof 8 is an 8-inch tall men's boot with a plain toe. It has Texon® Flexwelt® insoles. I've held out on spending so much for a pair of boots that I only wear a few times a year but they are worth every penny. I had the older model of these exact boot and upon wearing those out I decided to repurchase them for they've currently been the longest standing boot and I have worn almost all the brands. They seem to be holding up well. I've wrangled cows in 6 feet of mud and slush and simply aired them out and kept going. They are perfectly warm for me during the colder winter months hear in New England. My father who purchased the American version of this Chippewa boot appear, upon inspection, to have a higher grade of leather and a better grip. The toe leather on his boot appears to not chip as easily and has leather all the way to the top. My main worry is the stitching on the bottom of the sole of this boot as seen in the picture. I'm worried that as I wear the boots down the stitching will wear out. 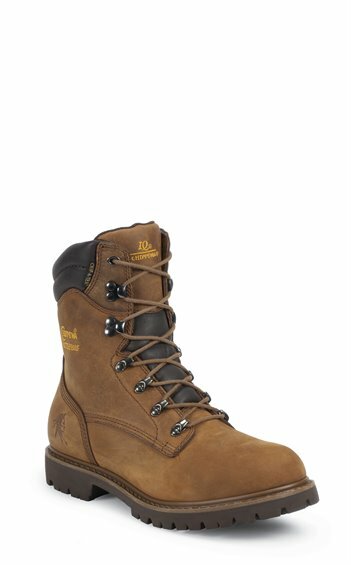 Id give this boot a go and you wont regret spending the extra few bucks knowing you have a quality workboot underneath your feet.